AGB Stone has four locations: Auckland, Hamilton, Christchurch & Cromwell, we service nationwide. We have one of the largest purpose-built stone factories in New Zealand, full of the best machinery for 100% Stone surface fabrication – no wood or MDF fillers will be used in any benchtop we make – you can be sure of that! Beware of Stone Veneer imitations available elsewhere. Make sure you ask for 100% Stone – No Wood! Whether it be Engineered Stone, Granite or Marble Benchtops, Hearths, Tabletops or Vanities, we have the best equipment to efficiently and accurately measure, make and install your 100% Stone surfaces. Our experienced, highly skilled and very proud staff have measured, designed, cut, polished and installed thousands of stone benchtops, from small single piece vanities, to large architecturally designed kitchens and multi-unit fitouts. We can make your stone surfaces 20mm thick for a contemporary streamlined effect at a great price, or we can mitre your stone to 100mm and beyond for that absolute Wow Factor! With our expertise, almost anything is possible. Come and talk to us about what you really want and we will do all we can to make it happen for you from 100% Stone. 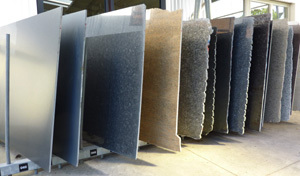 Our large premises house a huge range of slab stone available for your viewing. There are examples of the latest trends in Engineered Stone, Marble, Granite and Ceramic as well as some discounted and discontinued lines, offering you extraordinary value for money. We can provide polishing (give a high gloss effect to), or honing (give a matt suede effect to), large surface areas of stone, to help deliver whatever look you are trying to achieve. We do our best to help the environment. We recycle all of our water and, with no MDF use we are able to only produce waste suitable for clean fill. If you are under pressure, let us ease your burden. We have a turn-around time, second to none. Talk to us about how quickly we can make your kitchen complete. Our showroom displays examples of many stone options available and is equipped with a library of colour swatches of complimentary materials to assist in co-ordinating your project. We welcome you to visit one of our showrooms or contact us on 09 825 1030 to assist you with your requirements. Our friendly staff are committed to giving you unbiased professional advice to assist you in making the right selection of product to suit your needs. We always strive to produce quality goods that satisfy your needs. We have written our Terms and Conditions in plain English to make them clear and easy to read and we have used “we” for Affordable Granite Benchtops Limited and “you” for the customer. Any goods we supply to you will be supplied on these terms and conditions. If you order goods, you will be deemed to have accepted these terms and conditions, which may be varied only if we agree in writing. We will use our best endeavors to meet agreed delivery times but will not be liable for delayed delivery. Delayed delivery does not entitle you to cancel any order and nor shall we be liable for any loss or damage resulting from any delay. We will arrange delivery of goods to you at the address advised by you. Goods supplied will be invoiced at the quoted price plus GST. Payment of account is to be made strictly within the agreed trading terms we have with you. However, we reserve the right to require payment in cash before the goods are delivered. If payment is not made on or before the due date, we may charge interest on the overdue amount calculated on a daily basis from the due date until the actual payment, at a rate 5% per annum above the current overdraft rate charged by our bankers. The charging of interest shall in no way imply the granting of or any extension of credit to you. You may not deduct or withhold any amount (whether by way of set-off, counterclaim or otherwise) from any monies owing to us. You shall pay on demand all costs, charges and expenses including legal costs incurred by us in recovering any monies payable by you to us. If you commit any act of bankruptcy, become insolvent, have a receiver, a receiver and manager, administrative receiver or similar officer appointed in respect of you, or all or some of your assets, make or are likely to make an arrangement with your creditors, or have a liquidator (provisional or otherwise) appointed, or are placed under statutory or official management, all amounts outstanding under any contract with us shall, whether or not due for payment, immediately become due and payable. Our prices already include a 2.5% discount for cash, cheque or eftpos payment. This does not apply to credit card payments. When calculating credit card payments, 2.5% should be added. We warrant that all goods sold are free from quality problems at the date/time of delivery. Any claims for errors or damage in transit must be made within 14 days of delivery. Except for the foregoing warranty and any warranties which cannot be excluded by reason of the application of the Consumer Guarantees Act 1993, all warranties, descriptions, representations or conditions whether implied by law, trade, custom or otherwise are, and all liability of us, whether in tort (including negligence) contract or otherwise excluded to the fullest extent permitted by law. For the avoidance of doubt, the guarantees contained in the Consumer Guarantees Act are expressly excluded where you acquire or hold yourself out as acquiring the products for the purposes of a business. To the fullest extent permitted by law (a) the total liability of us for any loss, damage or injury arising directly or indirectly from any defect in or non-compliance of any goods, or any other breach of our obligations, shall in any case be limited to the lesser of the purchase price of the goods complained of, or the actual loss or damage suffered by you; and (b) we shall not be liable for any consequential, indirect or special damage, loss or injury of any kind suffered by you or any other person. No goods will be accepted for return unless previously agreed in writing by us. Risk of loss, damage or deterioration of, or to the goods, shall pass to you immediately upon delivery of the goods by us. Ownership of the goods shall not pass to you until all amounts owing by you to us, in respect of those goods and all other goods (if any) supplied by us, have been paid in cleared funds. If the goods are mixed with other goods and or sold before we have been paid, the proceeds of the sale shall be placed in a separate account of yours in such a way as to be clearly identifiable as our property. We reserve the right for ourselves or our agents to enter your property in the event of any default by you under any of these terms and conditions. (d) you waive your right to receive a verification statement under Section 148 of the PPSA. (c) will give us 14 days prior written notice of any change in your name, address, contact details, trading name, business practice or any other details and use your best endeavours to ensure that any applicable financing change statement is registered disclosing your new details. 6.3 To the fullest extent permitted by law, we and you contract out of section 114(1)(a) of the PPSA. If and for so long as we are not the secured party with priority over all other secured parties in respect of any goods, we and you agree that section 109(1) of the PPSA does not apply to those goods. Any price quotation shall only remain open for acceptance 30 days from its date unless we extend the time for acceptance. We shall have the right to correct any clerical error appearing on the face of any quotation. If at any time we do not enforce any of these terms and conditions, or grant you time or other indulgence, we shall not be construed as having waived that term or condition or our right to later enforce that or any other term or condition. Where any provision of these terms and conditions is rendered void, unenforceable or otherwise ineffective by operation of law that shall not affect the enforceability or effectiveness of any other provisions of these terms and conditions. In the event of any happening beyond our reasonable control and in consequence of which we cannot fulfill our obligations, we shall be entitled to either extend the delivery time of goods, or cancel our obligation to supply and in the event of such extension or cancellation we shall not be liable for any damages or other compensation.